Are paper documents and time-consuming tasks impeding the efficiency and value of your purchasing department? If so, it's time to get rid of outdated and ineffective processes and move to electronic purchasing. 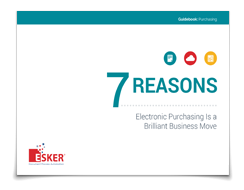 Learn more about Electronic Purchasing — download the guidebook today!